Ira Mooney built the Good Eats Café in 1935. Originally there were two entrances on Blair Avenue that led to two separate businesses, Buck's Barber Shop and Betty's Beauty Parlor. These were accessible by a wooden boardwalk. The basement of Buck's was the meeting place for members of the Dominion Club, an illegal gambling establishment. When the Sunset Theatre (built in 1935) was replaced by the Lode Theatre, constructed in South Wells, the Dominion Club moved into the Sunset. 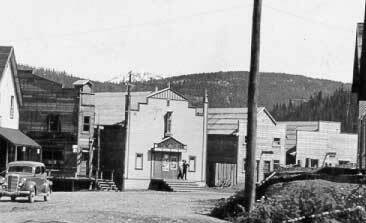 At this time, it was the only licensed gambling establishment in British Columbia. When operated by Bud and Ida Williams, in 1939, it was half rented by Don Macleod with a novelty shop and photo studio, and the other half by Fred Bustin's barber shop and clothing store. The basement had a large wood-burning furnace with a good-sized room attached, rented by Don for the sum of $10.00 per month. In 1959, the Good Eats Café opened and became famous for its 'sticky buns' and warm hospitality. The restaurant was closed in the early 1980s. The Good Eats has recently been renovated, and the owners hope to lease it out.